The folks at Equity Unbound explored the concept of Media Literacy and Fake News this week with a “studio visit” with two insightful participants — Mike Caulfield and Cheryl Brown. 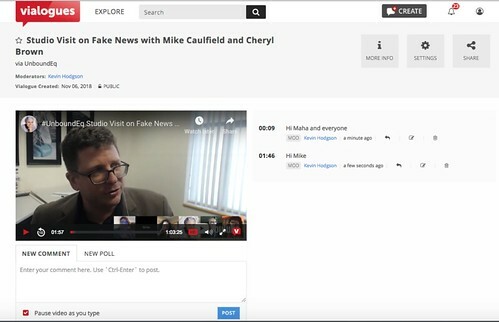 As it turns out, I am working with my sixth grade students this same week on this same topic of fake news and media literacy (through some cool symmetry of curriculum overlap), but I missed the hangout. I popped the hangout into Vialogues (which allows for conversations about video), so I could engage with the discussion from the margins. You are invited, too. And while thinking of Caulfield’s work around Digital Media Literacy, such as his Digital Polarization Project, I was pondering his conceptual framework of the Four Moves of determining the veracity of news, from his ebook Web Literacy for Student Fact-Checkers. 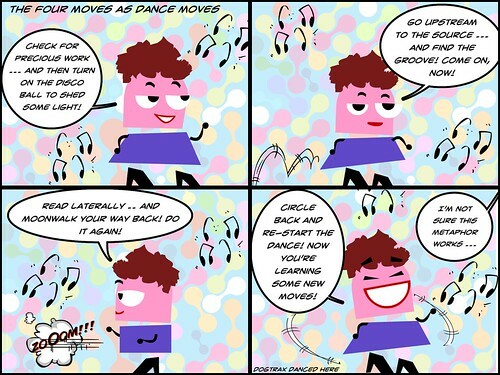 Somehow, in my brain, I had this idea of the Four Moves of fact-checking for students being re-conceived as Dance Moves. I know, it’s strange. This entry was posted in comics, EquityUnbound, Technology Resources. Bookmark the permalink. This is a great interpretation of the Four Moves. One of the composition texts I use is titled, “They Say/I Say: the Moves that Matter in Academic Writing”. It, too, uses the dance metaphor.